1. What should be done to introduce a new system administrator at BMC? There are several different systems a new employee may get access to. This is not a complete list of all systems that should be given access to but rather a list of external systems that one should at least be aware of. Some of these things have to be done before an employee start. Some of this applies to more than just BMC so you are more than welcome to take a look. Please let us know if there are things we are missing. Get an office. Chair, table, network. Do you need an ergonomic adjustable table? Make a raid down to the BMC campus office supply cabinet and get some pens, a notebook, a scissor and other office stuff that you might need. If you have a Mac, get an external hard drive to run local Time Machine backups. Get a standard PC and/or Mac up and running with the standard installation. When you have a UU account, make sure you are a local administrator. If you need to, get two USB-sticks, one with Windows (with MDT) and one with latest macOS so that you can reinstall computers. Be familiar with the instructions regarding reinstallation of Windows and macOS. There is a Mac installation server available on the BMC-Data network. There is a PXE boot menu available on almost all networks where legacy (not UEFI) installations of Windows can be done. Also basic network boot options for installing CentOS, installing Ubuntu and running Memtest86 etc are available there. Configure the computer to work with eduroam and duPrint. Make sure it works. Order a home directory at My Rudbeck and use the Medfarm voucher to get it for free. Make sure you can access this storage on your computer. Try out Filr the file sync system. Install the Filr client on your computer. Understand where data is stored. Make sure you can access the data both via Filr and directly. Let your boss order a phone, either fixed phone or mobile. Activate your access to the VPN service by following the instructions. You may get your own fancy BMC/UU hoodie at Grolls. Or whatever work clothing you need for doing your job. Apply for administrator access to the Local IT organisation in the Active Directory. This will control access to USER.UU.SE\BMC and USER.UU.SE\LocalIT\BMCI in the Active Directory. The terminalserver to use is called dcts.user.uu.se. The group BMC Computing Department in USER-AD (sorry for the odd name of this group) control some access to different systems, including the file share \\BMCIT-Common.files.uu.se\BMCIT-Common aka \\USER.UU.SE\BMCI\Common. The Symantec server (just FYI). You need an employee key card. This will grant access to the corridors at BMC but not to other campuses. You need a key to your office. Almost all offices at BMC campus management share the same lock and key. After instructions, you may get access to the BMC computer room at D11:0. The cross connect cabinets of BMC are locked with a special key which could be granted access via the BMC-administration if needed. There exists an extra key in the Nyckelpiga at the basement so one do not need a physical key all the time. Primula Web - wage, vacation, sick leave, parental leave etc. EasIT - the helpdesk system. This is the tool to handle support requests. Read the docs in the FAQ at http://it.bmc.uu.se/faq/ and SOPs at http://it.bmc.uu.se/sop/. You do not have to read everything but it is good to have an idea of what it is. Of special interest may be how to reinstall computers with Windows and macOS. There are more docs at the INV-Common share as well. Take a look at the environment and security web pages at BMC. Make sure you know the way to the recycle rooms and to the container for the combustible fraction. The university has intrductions to new employees. Book in the next scheduled event! There are a gym, table tennis room, showers and sauna at BMC. Read more at BMC - health. Please note that employees at Uppsala University get a small wellness subsidy every year which can be used for gym membership and other similar activites. Also when job allows you may have one hour of wellness activities every week on paid time. There are a couple of in-service bikes at BMC, two normal and two are electical. Lend them at the reception. In order to learn on how to handle waste on BMC, please read the documentation. Please note that no smoking is allowed closer than 15 meters from any university entrance. 2. What are the recommendations for buying a new mac? See also: How do I order a standard computer? See also: What's the name of the connector? Apple has switched to using only USB-C as interface for their MacBooks, which means that old adapters no longer work. There are adapters that convert to USB-C, but the cost is about the same as getting new ones, so we suggest that you replace the adapters to follow Apple's recommendations. You should think about whether you want a docking station on your desk or not. It reduces the number of adapters you need to connect each day. You probably need one or more adapters anyway (e.g. Apple Multiadapter HDMI and/or VGA) for your computer bag, for when you have to present something and need to connect the computer to a projector. In addition to this, Mac users should always have an external hard drive that backs up the entire computer with TimeMachine. This hard drive should always be connected to the computer on the desk and then stored in a safe place when not in use. Don't bring it when travelling! Please note that all prices mentioned below are subject to change! We recommend at least Intel Core i5 with 16 GB RAM and 256 GB SSD storage or better. Please note that the ethernet outlet on this adapter needs more power than the mac gives, which leads to problems with non functioning network after waking the computer from sleep. The workaround is to unplug an plug in the adapter but if there is an mounted external drive connected to the adapter when unplugging it, the disk will not be unmounted properly. That, in turn, can lead to data loss. Therefor we suggest not using the ethernet outlet on this adapter. 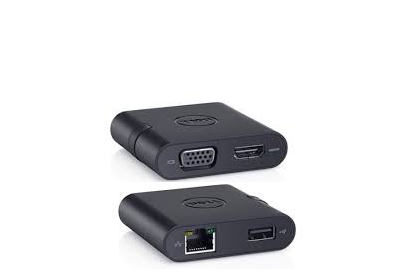 If you don’t want a docking station you need a network adapter to connect to the department network. Produktwebben, search for "WD My Passport for mac". Price is depending on the size of the disk. 3. 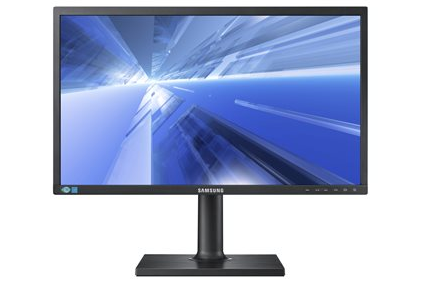 How do I order a standard computer? See also: What are the recommendations for buying a new mac? See also: What are the different PC form factors? See also: How do I buy a new computer? See also: Do you have some examples of fanless computers we can buy? 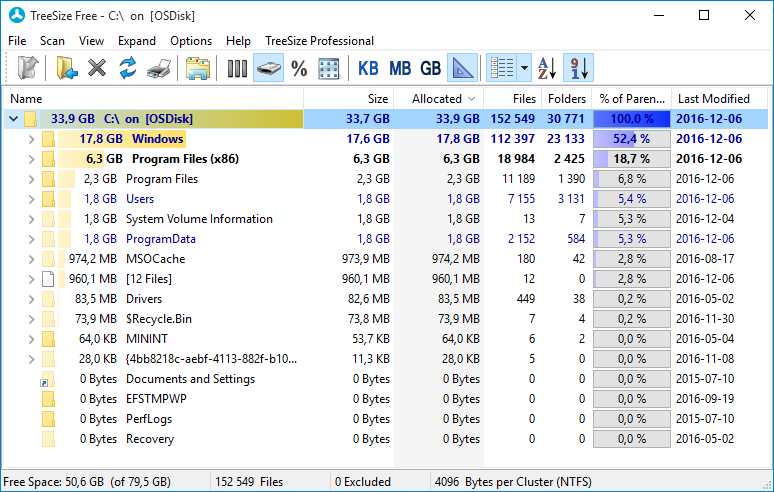 Currently (2018-09-18) we recommend Intel Core i5 with 16 GB RAM and 256 GB SSD storage or better. Please note that all prices mentioned below are subject to change. An all-in-one solution, the dock lets you power your Mac, drive two 4K displays simultaneously or one display up to 5K, and get up to 40 Gbps of super-fast data transfer with just a single cable. And with two built-in Thunderbolt 3 ports, you can connect your Thunderbolt 3–enabled Mac and daisy-chain up to five additional Thunderbolt devices at the same time. 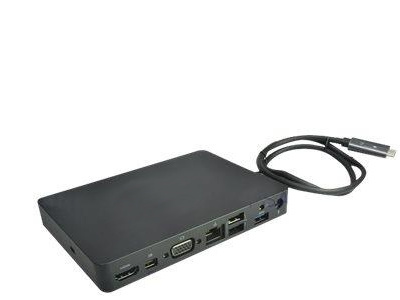 USB-C adapter with USB-A, USB-C, gigabit Ethernet, DisplayPort, VGA, and HDMI. 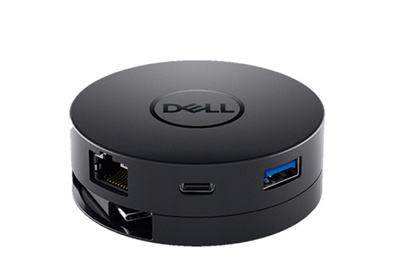 USB-A adapter suitable for using with Dell P2x19HC. 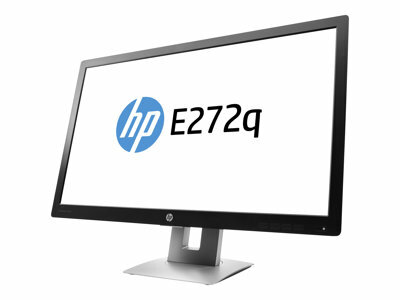 Screen 24" with 1920x1080 resolution. USB-C (PD 65W), HDMI, DP, DP out, 4x USB 3.0. Cables USB-C and DP included. 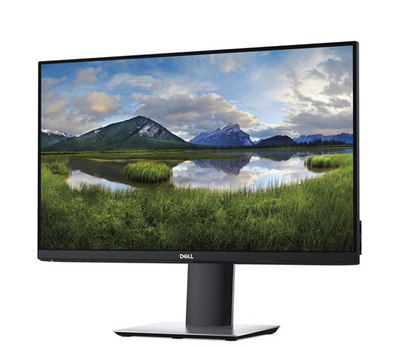 Screen 27" with 2560x1440 resolution. USB-C (PD 65W), HDMI, DP, DP out, 4x USB 3.0. Cables USB-C and DP included. 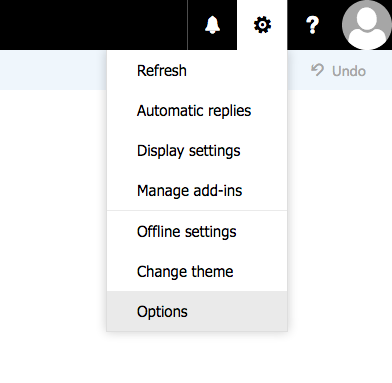 Send a mail to helpdesk@bmc.uu.se with your request. 4. What is Rrsync (restricted rsync)? How do I access PCFS storage over rsync? See also: What is the point with the zone files.uu.se? See also: How do I access PCFS over SMB using smbclient? See also: How do I do parallel rsync? The PCFS storage provided by BMC-IT is normally accessed via SMB. However the Uppsala University perimeter firewall in front of UpUnet (Fortigate) is blocking incoming SMB. The Uppsala University HPC center UPPMAX (Uppsala Multidisciplinary Center for Advanced Computational Science) has its own Internet connection via SUNET so SMB access from SUNET is blocked in the firewall. For those cases Rrsync (restricted Rsync) can be set up as well. To access it use Rsync as normally. However, Rsync now is using the /data directory above as base directory. ALl the shares are mounted under the /data directory. To access the data with Rsync may look like this. Here I tried to download the contents of a share I do not have access to, so just igore the error and use rsync as normal for transfer data. If you want to use your public SSH-key instead of your password for authentication then send the SSH key to the administrator. 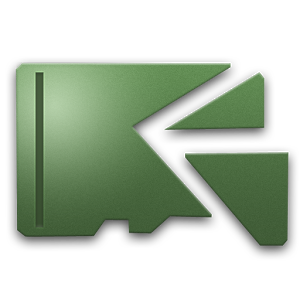 Kerberos single-sign-on is currently not suppported. Connect to Uppmax with SSH, in this example I am connecting to rackham.uppmax.uu.se. Start a screen so that you can keep your processes running even when your SSH-client disconnect to UPPMAX when you for example shutdown your computer. [jerker@rackham3 ~]$ rsync -avx --progress jny25782@imb-genomicsklt2.files.uu.se:IMB-GenomicsKLT2/. tmp/. In this example we are using another port because the normal port 22 was at that point still blocked in the firewall between UPPMAX and UpUnet. Also, compression is turned off, faster ciphers are being used and ssh escape characters are turned off. Here is an example when the contents of the directory /proj/mystuff/directory/to/upload/. 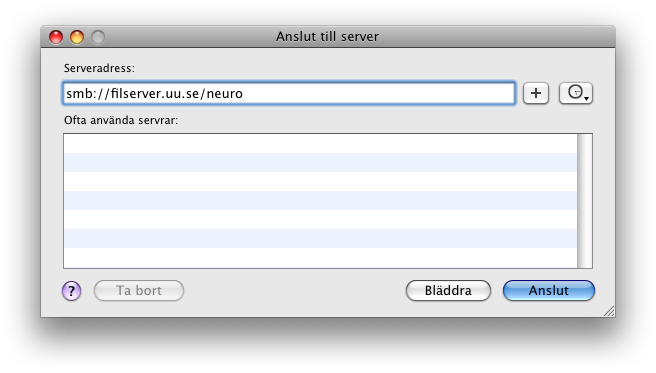 on UPPMAX will be synced to the directory TLA-ShareName.files.uu.se:TLA-ShareName/ShareName/directory.to.upload/. on PCFS. The flag --delete will erase all files from the destination that do not exist in the source. [jerker@rackham3 ~]$ rsync -e 'ssh -e none -o Compression=no -c arcfour,aes128-ctr' --delete -avx --progress /proj/mystuff/directory/to/upload/. 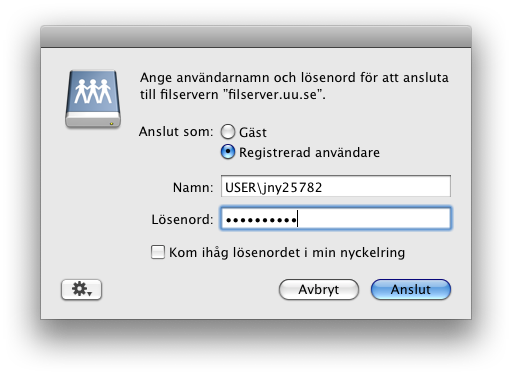 jny25782@TLA-ShareName.files.uu.se:TLA-ShareName/ShareName/directory.to.upload/. By using the notation above (the /. in the end) the rsync can be run multiple times to update/sync modified files again. Have fun! Disconnect from the screen with Ctrl-A Ctrl-D. Attach to the screen again with the command screen -x. 5. How do I map a network drive via SMB on Windows? See also: How do I use AddPrinterGUI to add printers in Windows 7/8/10 x64? Open the file explorer. Press Left Windows key together with E.
Learn about server name and path to your home directory or shared storage at "HNAS" above. Enter your username and password. Please note that the Windows domain USER has to entered. Do not use my username jny25782 but your own username. Enter your password A. 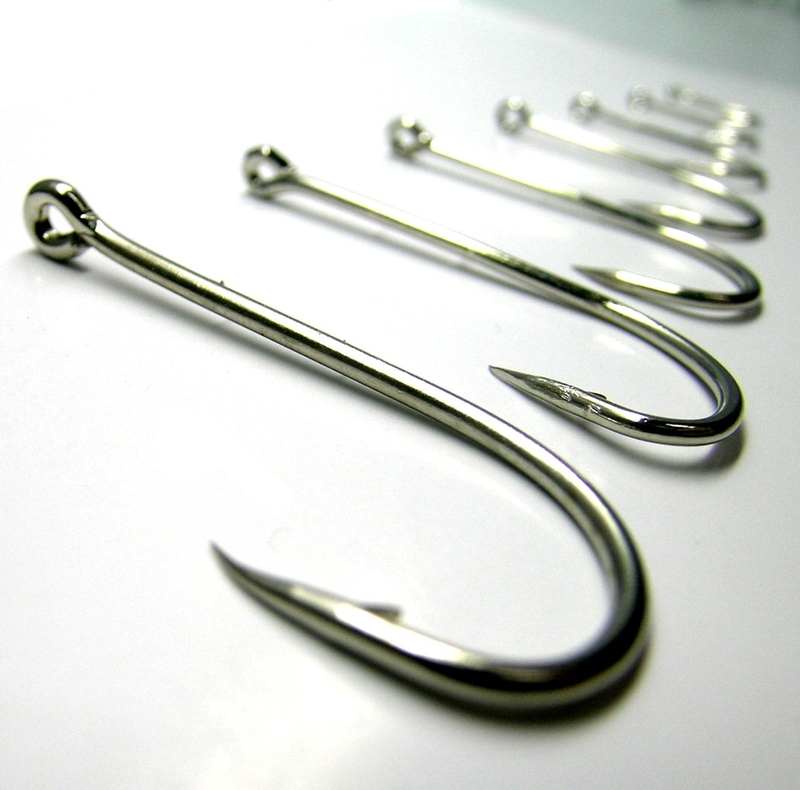 You may want to read about SMB Security Enhancements at Microsoft. 6. How do I connect to a file server via SMB on macOS? See also: How do I install anti-virus software on macOS? In the Finder, choose connect to server... from the menu. Another possible solution for this is to try using cifs instead of smb. Just replace smb with cifs in the path. Read more about Cifs and SMB at Wikipedia. /usr/bin/osascript -e "try" -e "mount volume \"smb://jny25782@bmcit-common.files.uu.se/bmcit-common\"" -e "end try"
7. What is the BMC-IT computer platform and how does it work? See also: What service levels does BMC-IT have compared to others at the university? See also: Who manages IT-support for whom at BMC? See also: What do the different symbols in BlueCat mean? See also: Do you have a virtual machine (server) I can use? See also: How does the reinstallation of Windows computers work at BMC-IT? The platform is the stack of software and infrastructure that BMC-IT use. Provide a well working platform environment for the end users. Listen to what the users need. Implement changes in the platform when possible. Work together with the university and use central systems whenever possible. Provide options for the users with different needs regarding management, storage and operating system. The network and maintenance is payed for by the rent. There are no extra cost involved. However new networks sockets have to be payed for by the tenant. BlueCat is a tool for IPAM, an interface to manage DHCP and DNS. BMC-IT are using whitelists in BlueCat to control what clients will get an IP on which networks. BMC-IT also using central TFTP (PXE) server maintained by IT-division. The server room is for use by the whole university. Servers BMC-IT maintain for the departments we give support too are paid for by the users of BMC-IT. MDT is used for installation of Windows and an engine for software distribution (Zenworks) on client computers. Munki is used for software distribution on Mac. Munki does one thing, program and configuration distribution, and does that very well. The client computers are joined to the Active Directory providing authentication and directory services. Light weight inventory of software and hardware. Currently run in Mediateket (student computer laboratories) and some Linux servers at BMC. Zenworks is used for software distribution on Windows. Packages that BMC-IT uses are mostly built by BMC-IT but some are shared over the university. Better storage. Cost 7000 SEK/TB/year (7 SEK/GB/year) in steps of 500 GB. Offline files may be used for access of Documents and Desktop, but not shared group folders. In the price range of cloud storage. Simple storage with compression, snapshots and rsync to secondary server. The solution can handle tens of millions of files with hundres of snapshots with snapshots for over a year. Syncronized storage, similar to Dropbox in functionality. 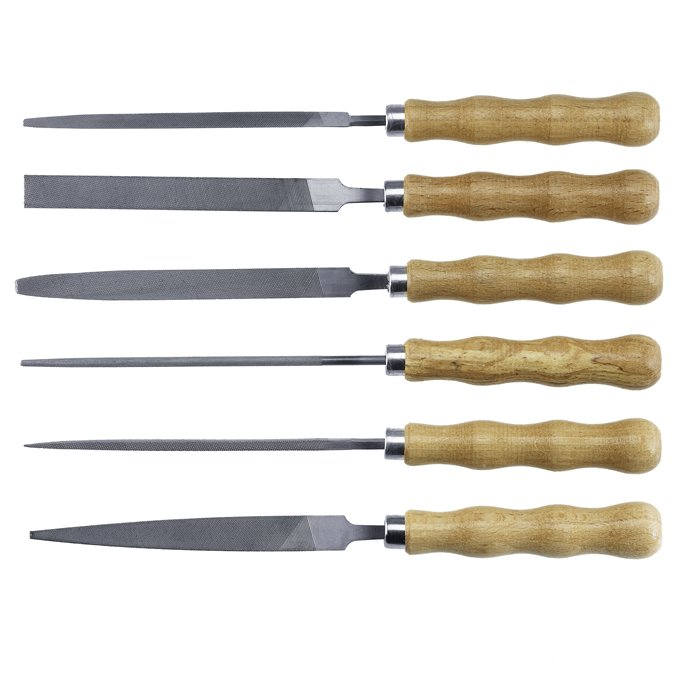 Currently used by a single department. IMB Spectrum protect is a enterprise standard backup and recovery system maintained by IT-division for the whole university. It is not very fast for many small files, in particular when backing up tens of millions of files incrementally. 8. We have a server, where should we put it? See also: What is the postal address for BMC-IT? See also: What is the cost of a PC file server? BMC has a server room in D11:0. The room was built in 2013 and is maintained together by the IT-division (UUIT) at the university administration (UADM) and Uppsala Biomedical Centre (BMC). The management team (styrgrupp) for the BMC-hall includes the IT director of the IT-division and the director of Uppsala Biomedical Centre. Dual routers (called the BMC-hall-routers) each with dual connections to the university backbone routers. Gigabit ethernet to each server. Dual redundant network and higher speeds can be arranged. The BMC-hall-router VLANs on the normal BMC-hall-switches cannot be shared with the VLANs on the router (called the BMC-router) for the rest of the building. Contact netsupport@its.uu.se for help with network configuration for the server room. 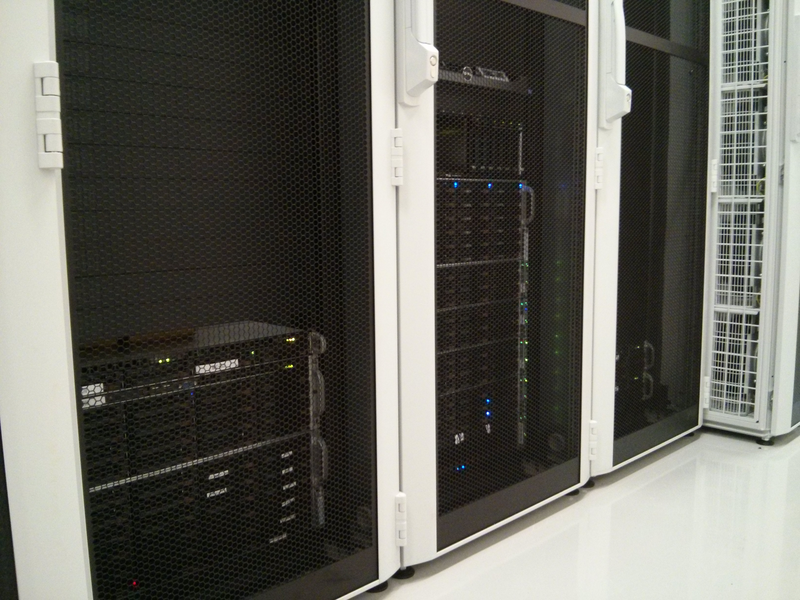 For renting space in the server room, contact bmc-hall@uu.se. Also consider renting virtual servers or using some of the shared services at the university before buying your own physical servers. 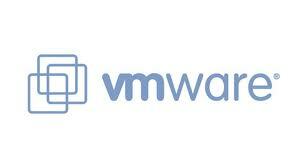 Contact uppdrag@its.uu.se for renting virtual servers in the the shared VMware environment or storage. Contact UPPMAX for using the shared HPC resources for computation and storage. Check on them from time to time to see what they are up to before building something on your own to reduce the duplicated effort. The BMC server room does not have a postal address. If you want to send packages of servers or other equipment to the server room at BMC please send to BMC-IT with your name as the recipient. (If you or your department has offices at BMC just send it to yourself at your department, do not send to BMC-IT.) Send us a mail to helpdesk@bmc.uu.se so that we know what is going on. When your package has been delivered you can pick it up at The Goods Reception and you need to show your ID. 9. My Windows computer is running out of storage. What is using it? 10. Where do I store my data? How do I take backup? See also: How do I manage access to a group storage at Argos? See also: How do I connect to storage at Argos? See also: How do I order a group storage at Argos? See also: How do I order a personal storage at Argos? The general idea is to focus on where you store your data instead of how you take backup of your data. You have to be aware of where your data is stored! Ideally the computer should not need to be backed up - all data should be on a secure file server. If the computer breaks down it should be possible to just grab another computer, login and access the data. Most standard software and configuration should be easy to reinstall. Make sure you store your data safely on a secure file server. Check with your IT support organisation which file server you should use. Recommended file servers are "HNAS" and "Argos". Store your personal data in a personal storage where only you can access the data. Store your group's data in a group storage where all users in the group can access the data. How do I work with my data? Mount your storage folder on your local computer and work directly with the files on the file server. If you need to access the data when not at the university, you can connect to the university network via VPN and then mount the storage folder. But I need all my data on the client! Also, the central service TSM can be used. 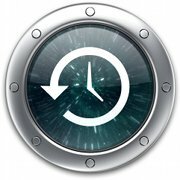 We recommend using the central service TSM to take complete backups of the Windows computer. Start storing your data safely on a secure file server. In addition to the above, the recommendation is that macOS users have a local, external hard drive that backs up the entire computer with Apple’s TimeMachine service. Since it's easy to setup and cheap to use, there is no reason to not take backup this way too. The hard drive should always be connected to the computer when in office, and then stored in a safe place when not in use. Don't bring it when travelling! Also, the central backup service TSM can be used. If your Windows computer is part of the BMC-IT platform, everything that is stored on your "Desktop" and in your "Documents" folder may already be automatically synchronized to your personal storage on the file server “HNAS”, and you don't need to do anything more than make sure your data is stored in one of these folders on your computer. If not, start storing your data safely on a secure file server, in a personal or group storage as mentioned above. 11. What about the GDPR? In this FAQ we have put the following symbol as a information security classifier. This is Konfidentialitet (Confidentiality), Riktighet (correctness), Tillgänglighet (availability) according to the SS-ISO/IEC 27001. The lowest value is 0 and the highest is 3. Please note that lowest value in the different other systems that a service is depending on gives the final grade of that value. Even if for example the UUIT VMware has level 333 the service (operating system and system administration) running in that environment may have a lower value. At Uppsala Universty a fourth number has also been added representing Avbrottsskydd (interrupt protection). (Riktlinjer för informationssäkerhet UFV 2012/714 ). We need to find out if this is still in use or not. As part of the above work, the data owner has to classify the data. BMC-IT provides no advice or support in regards to this. You can contact the Data Protection Officer (DPO) at UU if you need advice and support regarding issues that concern GDPR. Use this form but you can also send an e-mail to dataskyddsombud@uu.se. BMC-IT provides storage services and some technical solutions for protecting your data. We also guide you to other storage solutions at the university. Please read more at The storage section in this FAQ. Also read the Rudbeck IT FAQ regarding GDPR. 12. How do I take backup of the data on my computer? See also: Why use the university central storage (HNAS)? See also: How do I overwrite deleted data in Windows? See also: What about the GDPR? 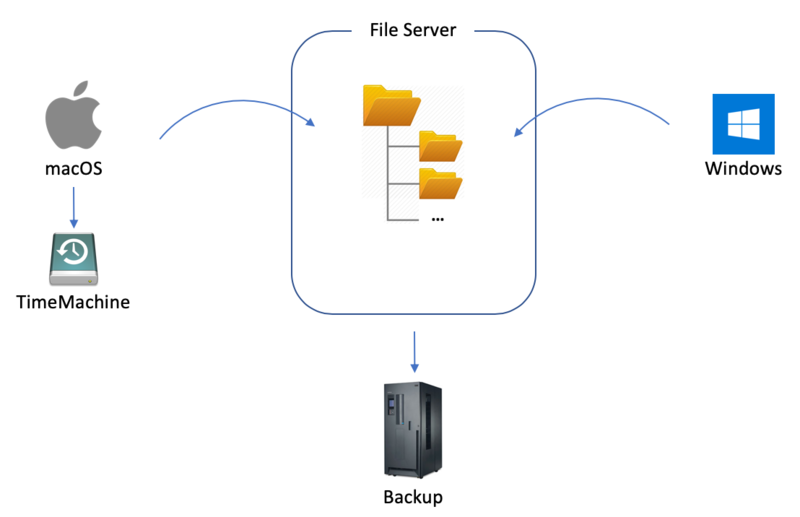 Different departments have different strategies on file servers. But this will more and more be central service at the university. The central HNAS file server has built in backups and also snapshots for old versions of files. This is good practice for both macOS and Windows. The university as a central service running TSM (Tivoli Storage Manager) run by IT-division that can be used for enterprise grade backup. Data will be stored in three versions up to 10 years, but this can of course be tweaked to any appropriate numbers. Use this for important documents. This is generally not set up on all client computers. Good for servers. For simple cheap backup, use for example on macOS the built in Time Machine Backup together with a local hard drive. There is no reason to not take backup this way too, because it so easy and cheap to set up. Understand that a shared time capsule is not much better than a single local hard drive, a good such service requires redundant hard drives. This is an just acceptable solution but requires discipline and using one local Time Machine hard drive at home and another at work is better. The most important thing with this type of backup is that at least one of the local Time Machine hard drives that you use must not travel with you and your computer. It stays at home! 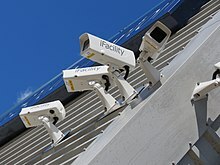 If the computer and backup are stored in the same location, there is a big risk that all data will disappear in case of theft or destruction of another kind (e.g. fire and liquids). Discuss with helpdesk@bmc.uu.se if you need advice in this or help buying extra hardware or order storage space on a file server. 13. Do you have a virtual machine (server) I can use? See also: How do I install Ubuntu? See also: What is the BMC-IT computer platform and how does it work? See also: How to get started with SNIC Science Cloud? If you need computer resources for high-performance computing (HPC) we recommend that you contact UPPMAX where you can apply for plenty of resources in the shared multiuser environment. If you need help contact helpdesk@bmc.uu.se and we can guide you. Rudbeck-IT have a a highly-available VMware ESX environment. Anyone at the university can rent a server. Contact helpdesk@rudbeck.uu.se if you are interested. The UADM IT-division (UUIT) has a highly-available VMware ESX environment where anyone at the university can rent a server. Contact uppdrag@its.uu.se at IT-division to order a virtual server. SUNET is offering virtual machines using OpenStack with KVM and Ceph. Role-based access control via SWAMID. Contact them for more information. The costs are more based on the resources used than the UUIT offer above. Direct link to price list here. SNIC Science Cloud (SSC) is a national cloud computing infrastructure run by the Swedish National Infrastructure for Computing (SNIC). Read more at the home page for SNIC Science Cloud. Read introduction to the SNIC Science Cloud. Several other department and local campuses have virtual machine environments that you already have payed for or are paying for. Check what your campus have. Please see the FAQ regarding computer platforms. 14. We need more storage! Do you have a file server we can use? See also: How do the different types of storage compare to each other? 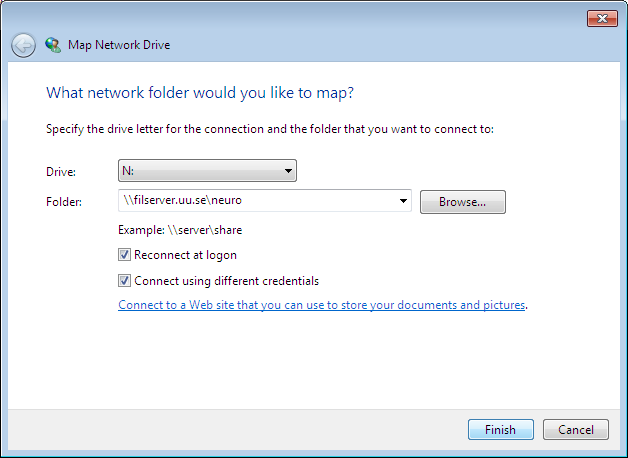 See also: How do I map a network drive via SMB on Windows? See also: How do I use an Apple AirPort Time Capsule? In general order by contacting IT-division or contact helpdesk@bmc.uu.se if your department is already using the service. The PC file server storage service is a cost-efficient storage solution for mostly high volume archive data. It is built of commodity PC hardware (which means the hardware can be replaced with equipment from other vendors) and open source software (no hidden costs or support agreements). This gives us freedom and a low price but it also means that we are on our own. The concept is from around 2010 where it was used for two departments. The service was originally built in 2016 for users at BMC who do not have to own their storage but since it is self-sustained it may be used by everyone at the university. The setup is fully documented in SOP - Install PC file server, SOP - Common service PC file server and SOP - Rsync backup to Btrfs snapshots. This means you can set up a very similar setup using the same concept on your own if you want to. Storage size in steps of 10 TB beginning with 20 TB. Each share is using dedicated drives. Good for archive storage of large documents like sequencing data, high-resolution images, and large movies. Snapshots are taken every hour. Hourly snapshots are saved for two days, daily snapshots for two weeks and weekly snapshots for two months. Monthly snapshots are removed on request. Optional access via Rsync (Using Restricted Rsync) and SFTP. Do not use for home directories. Rsync replication from primary server to snapshots on secondary server every night. Support and service is best effort during office hours. This means that if the primary server goes down during a weekend or vacation you may have to wait until the weekend or holiday is over until work can begin on resolving the problems. Order by contacting BMC-IT at helpdesk@bmc.uu.se. Everyone at the university may use the Rudbeck-IT file servers running EMC Isilon. 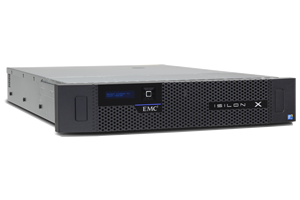 Technical Specifications Guide - Dell EMC Isilon OneFS and IsilonSD Edge. Storage size from 50 GB up to 128 GB, 258 GB, 512 GB, 1 TB, 1.5 TB, 2 TB and then in steps of 1 TB. Offline-backup using TSM where inactive files (deleted or changed) are saved the default 300 days. Uppmax has storage which is free if you have applied for and been granted resources. Please go to www.uppmax.uu.se to figure out what UPPMAX can do for you. 15. How do I mount my home directory or shared storage at HNAS? See also: How do I connect to a file server via SMB on macOS? See also: How do I mount SMB share in Linux? See also: How do I access my home directory? For Windows clients in USER-AD your home directory and the department common (public) share will automatically be mounted when you login using the drive letters below. This storage is in the university shared HNAS file server. Some departments also have other storage available - contact helpdesk@bmc.uu.se for details. Sometimes you want to mount via the command line. Also read in the SOP - Connect a Mac to HNAS (v1.0).pdf or follow the links to other FAQs above on how to use the Windows Explorer or Mac Finder GUI. Remember to use the VPN if you are connecting from outside the university network. A common problem may be that your account has not got the correct permissions called group membership in AKKA, the university catalogue. Please then contact your department administration to get this fixed. 16. How does the new Adobe Creative Cloud Named license model work? See also: How do I sign my documents with an electronic signature? All products from Adobe Creative Cloud – except Acrobat and Elements. The products can be rented separately or in a package called "Creative Cloud for teams All Apps". The rental period is one year and cut-off date is 24/12. Licenses that shouldn't be renewed should be terminated before the cut-off date, or they will automatically be extended for another year. Notice of termination shall be sent in due time before the date of expiry. 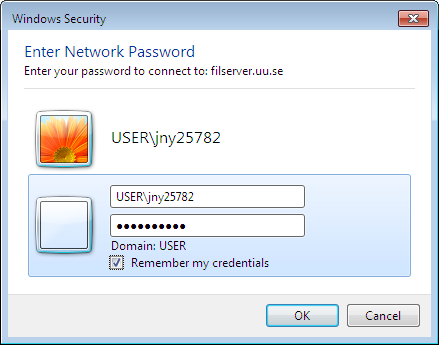 The Named license is attached to the user who the license is registered to and can be installed on multiple computers. The cost for a NAMED USER license is a bit higher but it has it advantages. For instance, you can install it on severalcomputers and mobile units. Then, you choose which two units that shall be activated by logging in to Adobe CC on them. When you want to activate a third unit, you will get a question about which one of the already activated units you want to deactivate and because it is as simple as logging out from Adobe CC on the chosen unit, it's easy to have access to Adobe CC on several units with a NAMED USER-license. Important! - The Named User license contains functionality for cloud storage at Adobe. There are special rules for what and what not to store in a cloud service. It is completely forbidden for certain types of information. The user must know and comply with the regulations for cloud storage. Guidelines are available below, and decision regarding use of cloud storage with Adobe's Named license is available below. 17. How do I connect to storage at Argos? 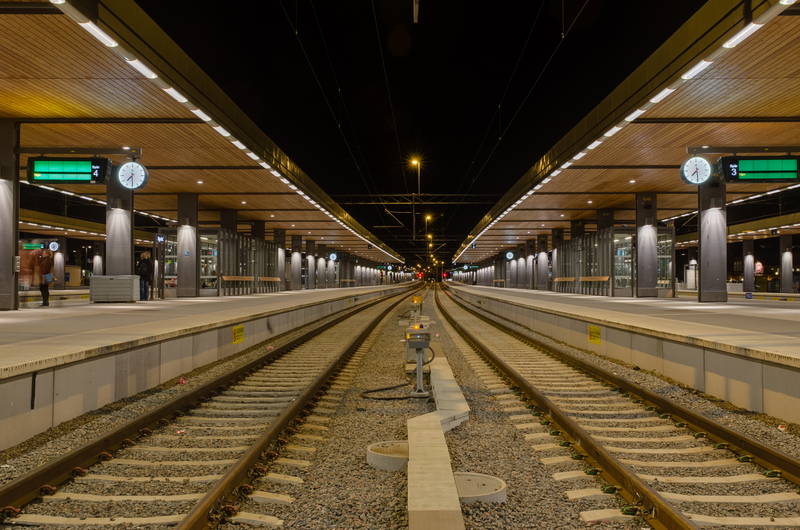 The file server is currently only accessible within the Uppsala University network or from home using VPN. You can access your folders directly using the SMB protocol. It is also possible to use Filr to access your personal folder using desktop, mobile or web clients. Please use the guides at Rudbeck-IT portal “My Rudbeck” to see the different options to access the storage spaces. Please note that Windows users with a BMC-IT installed computer should use the alternative "Access via server address" to connect to the storage. 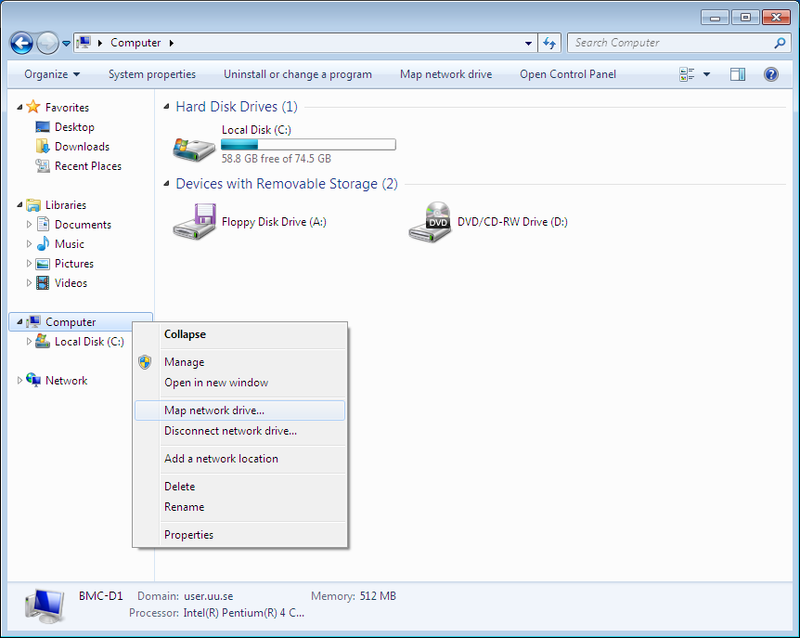 Learn more about how to map a network drive to your Personal Storage above. 18. How do I manage access to a group storage at Argos? Follow the guide at the portal “My Rudbeck” to manage the access to your group storage. Remember to make one user "Admin" (probably you). 19. How do I order a group storage at Argos? The group leader (or designated person) can create a group storage on his/her own. Follow the guide at the portal “My Rudbeck” to order a group storage. The title must be unique to the system. Check your group policy for which level of security you should choose. If you have a voucher with prepaid storage that you want to use, click on the voucher alternative. 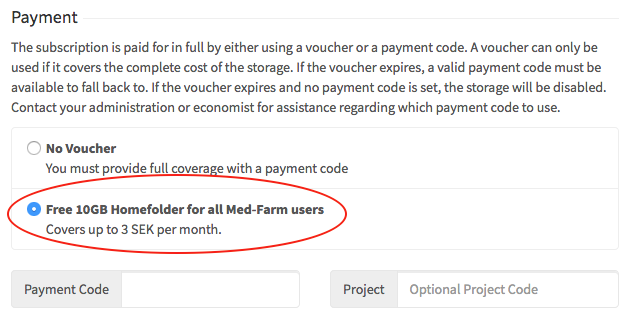 If you don’t have a voucher, or if you want to have more space than the voucher pays for, click on the alternative “No Voucher” and enter a Payment Code (usually the reference code for the group), for where to place the cost for the storage. 20. How do I order a personal storage at Argos? Follow the guide at the portal “My Rudbeck” to order a personal storage. If you have a voucher with prepaid storage that you want to use, click on the voucher alternative. If you don’t have a voucher, or if you want to have more space than the voucher pays for, click on the alternative “No Voucher” and enter a Payment Code (usually the reference code for the group ), for where to place the cost for the storage. 21. How do I send a large file to someone outside (or inside) the university? We recommend using SUNET Box for this kind of service. Please read more at Medarbetarportalen - SUNET Box: cloud file storage and sharing. Please also read about comparison between different services at the UB FAQ Filr vs SUNET Box vs Dropbox. 22. What do I do with old computers or phones? See also: After my employment at the university has finished, may I bring home my old computer? Why can I not leave everything at the electronic recycle room? The storage (usually a hard drive or flash memory with permanent storage) in may contains software with licenses belonging to Uppsala University (Windows, Office, Adobe etc). Sometimes the storage contains passwords (stored in Firefox, Safari, Internet Explorer, Outlook, Thunderbird etc), password hashes (kerberos keys in Windows, macOS etc) or private keys (PyTTY, OpenSSH etc). Sometimes the drives also contains sensitive personal data or data of other sensitive nature. Please fill in the form Data deletion approval. Give the equipment to BMC-IT. We will either scrap it or try to reuse the parts. If it is not for scrapping or possible reuse we cannot store it. Report the equipment as scrapped in the department inventory. Remove the permanent storage (hard drive, solid-state drive, flash or other). This may not be possible in all devices. Give the storage to BMC-IT (or your Local IT). If the storage contain really sensitive data it will be sent to the Security and safety division or the facility they recommend. If the data is not as sensitive and the drive is meaningsful to reuse, we will erase the drive on the block level (killdisk) and then reuse it. Bring the equipment to the electronic recycle room at The Goods reception at BMC. 23. What are the bitrates for different digital video quality? Please check the webpage at Youtube regarding Live encoder settings, bitrates, and resolutions. 24. Do you have some examples of fanless computers we can buy? Please check this detailed list of fanless laptops and ultrabooks available in 2018. 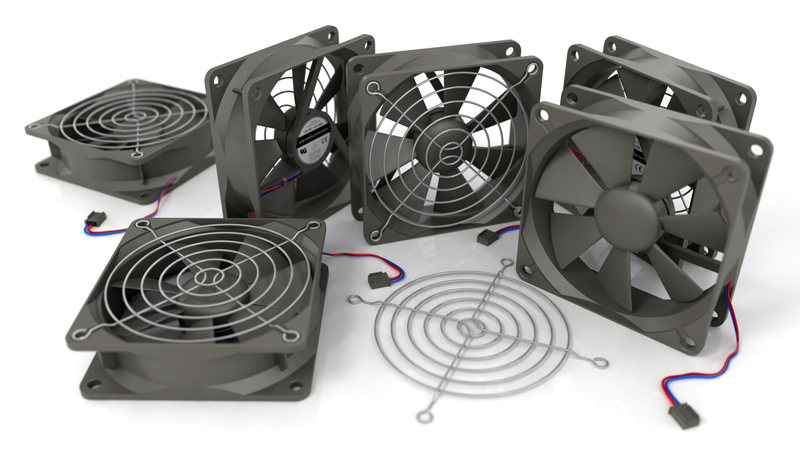 Please note that even fanless computers with no moving parts may emit high-frequency sounds that some but not everyone can hear. Price from 12077 SEK (2018-05-31) with 12.3" screen, Intel i5 1.2 GHz, 8 GB RAM and 256 GB SSD. 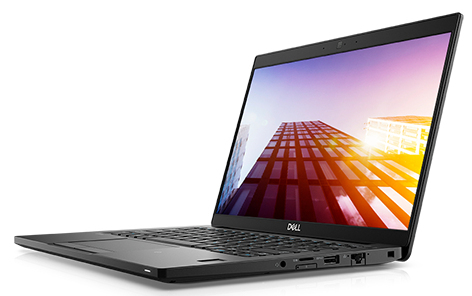 Price from 12244 SEK (2018-05-31) with Intel m5 1.2 GHz, 8 GB RAM and 256 GB SSD. 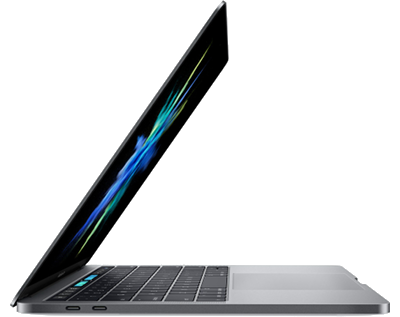 Price from 7677 SEK (2018-06-01) with Intel m3 1 GHz, 4 GB RAM and 128 GB SSD. Price example 10854 SEK with Intel i5 7300U 2.6 GHz, 8 GB RAM and 256 GB SSD. Price from 10200 SEK (2018-05-31) with Intel i3 1.2 GHz, 8 GB RAM and 256 GB SSD. Price from 2034 SEK (2018-05-31) with Intel Celeron N3160, 4 GB RAM and 32 GB SSD. Price from 5931 SEK (2018-05-31) with Intel i5 7200U 2.5 GHz, 8 GB RAM and 256 GB SSD. Price 304 SEK (2018-05-31) with ARM 1.2 GHz quad core and 1 GB RAM. Also requires case, storage, charger etc. This is not a PC and cannot run normal Windows. Go to the Raspberry Pi homepage Download Section for software, including Raspbian, Windows 10 IOT Core or others. Price from 9060 SEK (2018-05-31) with Intel Atom 1.33 GHz, 4 GB RAM, 500 GB HDD. Price from 14995 SEK (2018-05-31) with Intel Celeron 2.8 GHz, 4 GB RAM, 500 HDD. Price from 1100 SEK (2018-05-31) with Intel Atom Z8300 1.44 GHz, 2 GB RAM and 32 GB flash. See also: How do you secure delete data from the computers and servers? 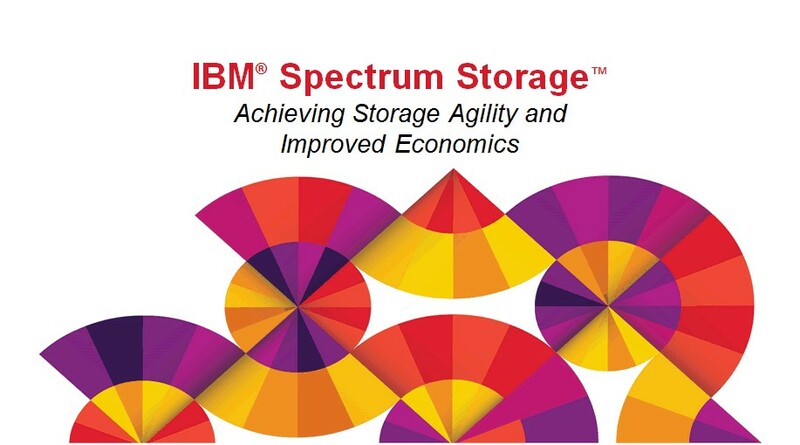 IBM Spectrum Protect is the backup system run at the university at the IT-division. 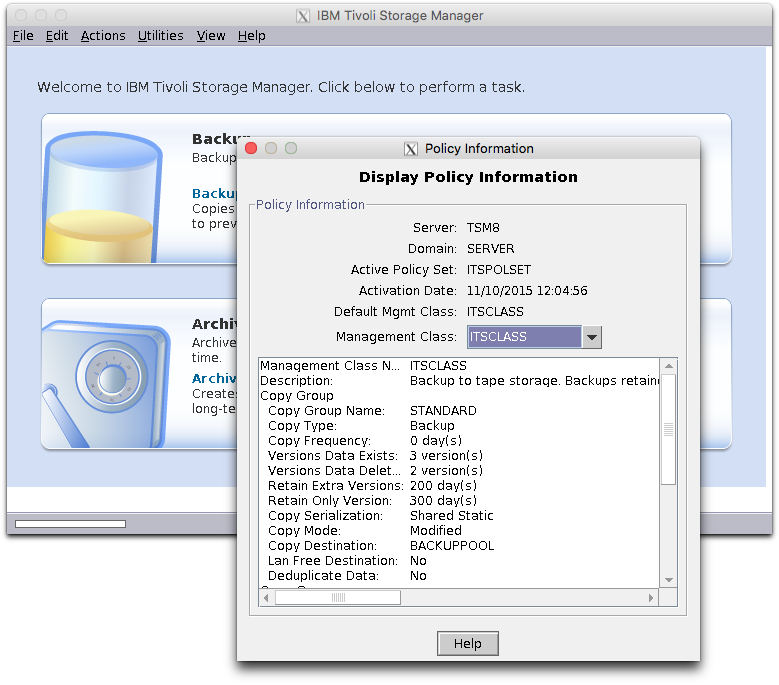 The software was previously known as TSM - Tivoli Storage Manager and is still referenced as both names. The services is paid for by the users. This includes salaries for everyone involved in maintaining the system and all equipment. The costs includes a starting cost per node and (decreasing) cost per GB depending on how much data that is stored in the system. Read the pricelist. Usually on Windows-systems the backup-client is asking the server whether it should backup or not. Send a mail to backup-admin to let them know. To put this in crontab in a Linux system first run editor for the crontab as root using emacs as an editor. TSM store files in tapes and after a while the incremental backups will store files in several different tapes. One way of taking care of this is to instead from time to time do a selection backup or a image (block device) backup. The block device backup is harder to read back for certain files obviously. There are several options to decrease the amount of data being sent on the wire by doing more work on the client. Inside the university network this usually it not a problem since we usually have enough bandwidth betwen the campuses and to the backup servers. Zip up many small files and exclude the originals from backup. Use virtual mount points to divide up the files in smaller sets. Use memory efficient backup, if the client is running out of memory. The option -inactive will list both active and inactive files. dsmc restore -pick '/blue/*' "/tmp/"
To restore the state of a directory at certain different points in time. This will run the restore command each for the specified dates and restore the directory as it were at that point in time. To delete a backup (which may require extra permissions), use the delete command. This time the -pick makes it interactive. To delete all files from the backup, including inactive files, specify -deltype=all. Do not prompt for confirmation. This however do not delete parent directories from the backup. To remove them to, run the expire command. The position of the wildcard is described at IBM but look a bit strange, so be careful! Please note that this may (or may not) only affect new objects created in the backup system. Manual clean up (using the method in the previous section) may have to be done. The output looks like this on the current (2016-05-16) classes on the domain that I are using. Note that there may be different domains with different management classes. This is how to Assign management class to specified directories or default. 26. What is ransomware and CryptoLocker? See also: Help me I get so much spam! What can I do? See also: My computer has got a virus! What do I do? CryptoLocker is a ransomware trojan that targets computers running Microsoft Windows. CryptoLocker and TorrentLocker infects computers running Windows via seemingly innocent email with links or attachments. There has appeared other ransomwares attacking Mac too. Read more about ransomware, TorrentLocker and CryptoLocker on Wikipedia. To be infected, the receiver has in most cases actively tried to open and execute the payload. The payload may be disguised as a Word-document, a script or something that give the impression that it is innocent. Do not open files or attachments you have not requested! This (the example above in Microsoft Word) is not safe! Please be careful with Office files that require you to Enable Content. Enabling content may make it possible for evil macros to execute in Office allowing the attacker to take control of your computer. 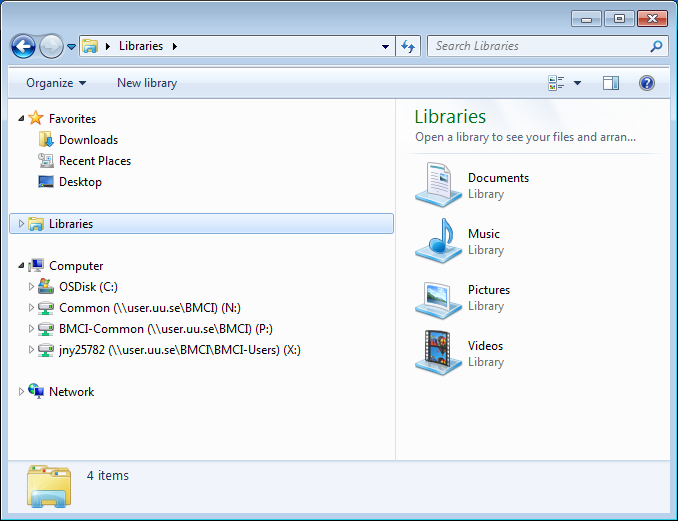 This (the example above from Windows File Explorer) is an example of an opened .zip-file. 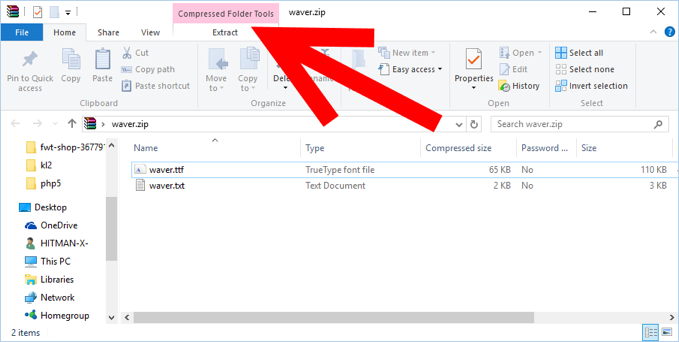 .zip-files are in itself not dangerous it is just a way of storing one or many files into one compressed file, but it may be a way to bypass other simple security checks. For example the anti virus software may warn when downloading an .exe-file but may not warn when downloading a .zip-file. This (the icon above) is an example of how an .js-file look like in the File Explorer. This file will run with the Windows Script Host (wscript/cscript) and execute and may download further potentially evil binaries. Windows Scripting Host also will run .jse and .wsf-files. 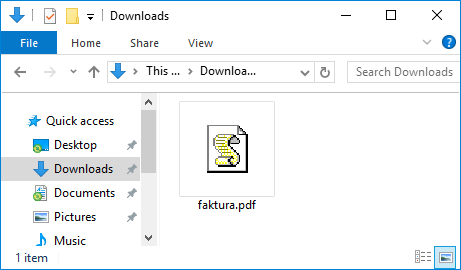 Also note that a long file name like faktura.pdf.js may hide the real extension in File Explorer and show up as faktura.pdf which is a bit misleading. The real file name extension is hidden. Even though a ransomware in itself easily can be removed, the files stay encrypted, waiting for a ransom to be payed in order to get the decryption key. Do not execute programs or even open attachments that random people have sent you. If you have any suspicions regarding something you received via mail contact helpdesk@bmc.uu.se (BMC-IT). Please forward the evil mail to no-spam@uu.se. Then the Uppsala University Security Division may adjust the rules for the mail filter and network firewall. Contact your local IT (helpdesk@bmc.uu.se) for help. Forward the evil mail to no-spam@uu.se so that the Uppsala University Security Division may adjust mail filter and network firewall rules. Change your passwords at the university. Change all passwords for all sites that you have automatically saved in your browser. In general, reinstall computer and restore data from backups or snapshots. Use a file server with snapshots for storing data you do not want to lose. For example the central university HNAS file server store snapshots up to a month per default. Everything locally on the computer running in the same security context as the user is not safe. This means that local previous versions / snapshots are not safe, if the users can turn them off. But to have these are better than not. This also means that backups like Time Machine, Cobian or similar where the system stores a copy of the files on another storage place is not safe, unless the backup storage in is snapshotted outside of the users security context. If you store extra backups of your files on external USB-attached storage, do not keep it plugged in all the time. Keep a couple of them and in rotation so that you can go back to an older version. Already taken backups should not be allowed to be overwritten from the client. This can be accomplished by for example using snapshots on the backup storage, like on a file server. Even more advanced backup systems like TSM may not be safe since it only stores a limited number of versions of each file. If the ransomware encrypt the files and then make some small updates to the file each day, then after the limited number of days have passed, all old uncorrupted versions will be gone. Read more from Europol's European Cybercrime Centre with friends at the No More Ransom! website. The Uppsala University Security Division has courses in basic information security (in Swedish). Every chapters just takes 2-4 minutes. There are 16 chapters in total. 27. How do you secure delete data from the computers and servers? References to backed up files can be delete from the client, but the data is not written over. It is possible encrypt the files on the TSM system at the client. The TSM systems at university is level at 3 3 2 or 3 3 1. (reliabilty, unaltered, availability) The availability is not 100% for example the system is down during times of softare updates. When the backup system is changing generation all drives and tapes are destroyed. Please read more about information classification at Uppsala University. On clients we use the utility KillDisk to secure deletion of block devices. If needed the drives can also be sent to destruction via the Security Division at Uppsala University or in a way approved by them. When the servers are put out of commision the drives are sent to destruction via the Security Division at Uppsala University or in a way approved by them. 28. After my employment at the university has finished, may I bring home my old computer? See also: After my employment at the university has finished, may I keep my old e-mail address? See also: What do I do with old computers or phones? Unfortunately no. The computer belongs to the university even if you bought it with your research money through the university. This is the general rule. It has to be a government facility (like a university). The computer may not be brought to a private company even if the private company do research. There has to be an agreement (understanding) between the old employer (head of department) and the new employer. The equipment has to be removed from the university (department) inventory and added to the new employers (department) inventory. The equipment will not belong to the individual but follow the normal rules of the new employer. Remove the permanent storage and send it to destruction. Permanent storage may be a hard drive (HDD), a solid state drive (SSD) etc. Please note that even block level wipe of the storage does not delete bad blocks. If the data is so sensitive that this is not acceptable the storage has to be destroyed and cannot be repurposed. Contact BMC-IT for help with this. From time to time, the department, campus or university may sell old equipment to the employees. But it has to be sold at market value and the costs involved have to be covered. All software licensed to the university have to be removed. For example all our versions of Windows and Office have to be removed. Instead of Windows for example Ubuntu or any other free operating system or software may be installed. In practice all of this makes it very hard to sell old equipment in an usable state at a reasonable price. Old equipment may sometimes be valuable in itself. 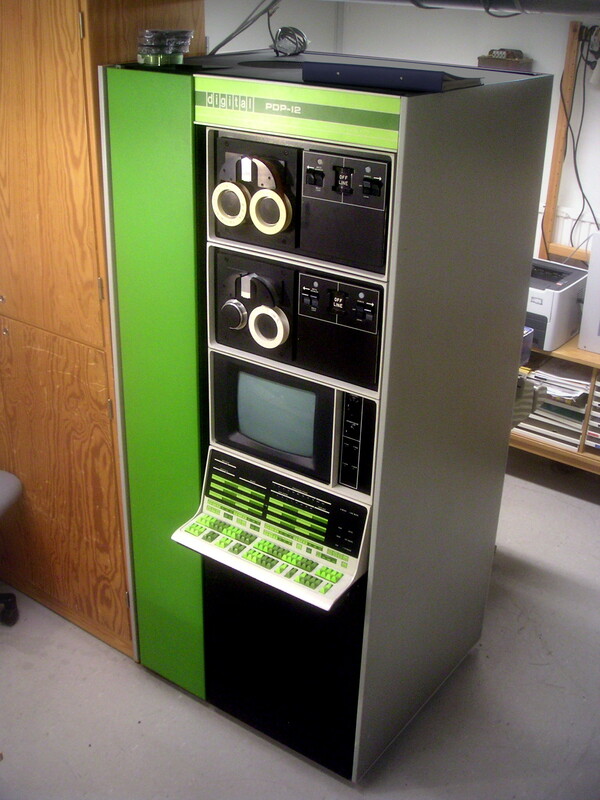 The computer in the picture is a PDP-12 belonging to the Update computer club at Uppsala University. 29. How do I get deduplication to work in Linux? See also: How do I configure my resolver on a Linux machine? ZFS is great for compression and snapshots, but regarding deduplication: Don't go there. ZFS on Linux is doing inline deduplication and requires at least 5 GB of RAM for each TB of storage. It is usually better to get more hard drives. When using too much RAM everything will slow down to a crawl. Btrfs is not as old and stable as ZFS, but it has compression, snapshots and deduplication. The deduplication in Btrfs is out-of-band. Compression is stable. Go ahead. When using snapshots and Btrfs, we recommend not saving more than 24+6+3+11 snapshots, each hour for a day, each day for a week, each week for a month and each month for a year. Otherwise (like saving a snapshot every day and not removing them) the snapshots may take too long time to remove. It seems like Btrfs is checking each file for each snapshot when snapshots are removed on order to know if the original file can be removed. There must be more than enough time (and IOPS to spare) to remove snapshots before new can be created. Deduplication is run using en external tool. Easiest is to use duperemove on the dataset, we have however not tried any larger datasets. There most probably are other ways to do this. Let us know. 30. My Android device is running out of storage. What is using it? See also: My Windows computer is running out of storage. What is using it? 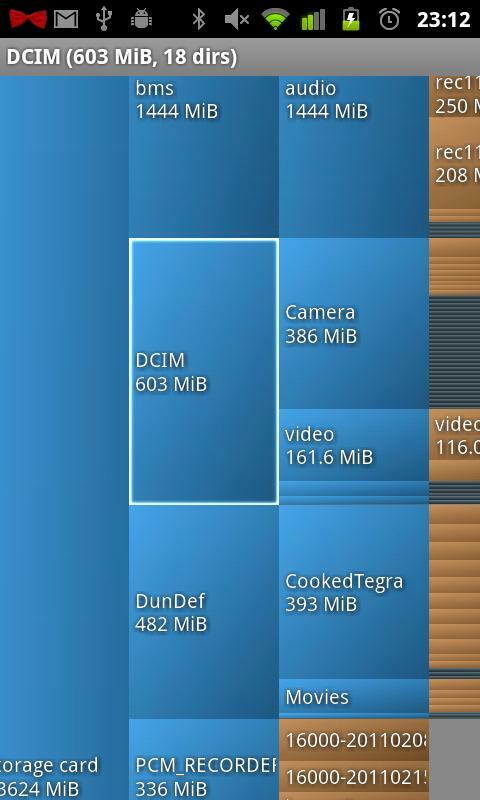 The app DiskUsage by Ivan Volosyuk is quite good in visualizing and finding what applications are using a lot of storage on an Android device. 31. What is the point with the zone files.uu.se? See also: What is Rrsync (restricted rsync)? How do I access PCFS storage over rsync? The initiative for the domain files.uu.se was taken in 2015-05 by BMC in order to get an aliases to file server shares with unique names. For example, the file server share is named with the TLA-SHARENAME, like INV-Common. Then the CNAME will be TLA-SHARENAME.files.uu.se or INV-Common.files.uu.se pointing to the current file server where the share is located. Get a unique name in DNS to each file server share. This will faciliate migration of file server shares to new servers. We (the university) had a lot of troubles with migration from the old NetApp file server to the new HNAS file servers. This zone with an extra level of abstraction in front of the real file server names was intended as a proactive way of eliminating one part of the problem in preparation for the next file server migration. It also makes it easier for those users users (research groups or department) that wish to or have to move their share from one storage system to another. Make it work for all operating systems. There is a function in the Microsoft Active Directory (with a similar goal) called the DFS that put all file server shares in a single name space. This however do not work all the time in all operating systems, like non-AD connected Windows-clients, macOS (not all of the time), Linux (it depends a lot on the configuration it do not work for example in Ubuntu out of the box). Network agnostic Get access to the servers even from other networks where needed when the USER-AD (user.uu.se) is not accessible due to using split DNS and access restrictions, like UAS, SLU, UPPMAX, HPC-centers in Sweden and maybe mobile data. It is also not a requirement to use the university resolvers, it should work even if the local resolvers are down. 32. What service levels does BMC-IT have compared to others at the university? See also: What Internet bandwidth does the university have? The different organisations at the university have different level of service in order to fullfull their missions on a cost-efficient way. UUIT (IT-division) provides highly available services for the whole university. BMC-IT is focused on providing great services for the people at the campus and is trying to keep it simple and durable. UPPMAX is providing the best high-performance computing environment available, but is neither focused on high-availability nor user-focused service (not the individual users, but as a collective of course). 33. Why use the university central storage (HNAS)? 34. 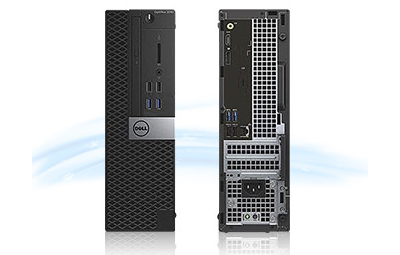 What is the cost of a PC file server? Please note! BMC-IT has a PC storage solution service. Read more in the SOP - Common service PC file server. Also note that for home directories we recommend using the IT-division HNAS file server. Very cheap Good for lots of data when the price has to be low. Acceptable speed Good bandwidth - can receive and send 1 Gbit/s (or 10 Gbit/s with appropriate network and multiple clients). Since the drives are rotating HDD, relative SSD the latency is high and IOPS are lower. But it works fine with large files. Low availability BMC-IT in general only do support during office hours. If the PC server totally breaks down (it may happen!) 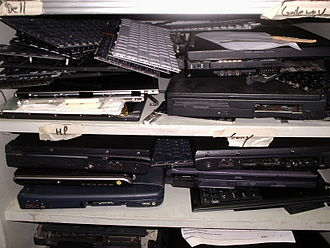 it will take some time to get service or spare parts or restoring from backups. Compare this with the IT-division HNAS file server which has built in redundancy. Linux and Active Directory These examples uses Linux (preferably CentOS 7) as an operating system and connects to the university Active Directory and works as a file server using Samba. More complex setups than this may need extra time to set up and maintain. For example running a Windows server instead of Linux requires extra costs for licenses. This is a Supermicro file server with enterprise drives. Includes ship-in support from Southpole. Normal HP file server with enterprise drives, three year next business day on-site support from HP. This is a Supermicro file server with archive drices. Cost for raw disk SEK/TB/year. Cost for usable storage SEK/TB/year. 35. My mailbox is full! What do I do? The Exchange mailserver at the university has a limited amount of storage quota for each user. This is to prevent a single user from accidentally filling up all space. No worries. Just contact contact helpdesk@uu.se to get more space. Send a mail from your own account and ask for a more mailbox space. Mailbox usage should be reported in the right bottom corner. 36. How do I access my home directory? 37. How do the different types of storage compare to each other? This is an illustration how how the different types of storage that is available compare to each other regarding Availability, Reliability, Performance and Price. High reliability means a low risk of data loss over a long period of time. High availability means the system is (almost) always online and in order to do this it has to handle equipment failures of different kinds and still be running. Performance may both mean high IOPS (many small requests) and bandwidth (lots of data), but here it is simplified. One of many things that are beyond this comparison is the cost of entry. A single big PC-server with a lot of disk is around 250 kSEK and can store 576 TB raw data (around half of that is usable when using 3+2 RAID6 plus hot spares) and may last with support for around 5 years. A small share on the HNAS file server, which may be useful for a whole department storing small but important files, may be as low as 1 TB and cost 7000 SEK/year. A Ceph system is only recommended if one is scaling it up to a lot of file servers (and a lot of time for system administration) providing huge amount of bandwidth. In practice this means that a PC file server, with proper backup or remote snapshotting to another PC file server, may be useful for storing a lot of data cheaply, but not for example used as 24/7 available file storage. The university HNAS file server service is a very good for general storage of data in a safe way. Availability-Performance comparison The performance in the HNAS system and a PC with SSDs is great, but HNAS is a lot more available since it has fault-tolerant hardware to higher extent. 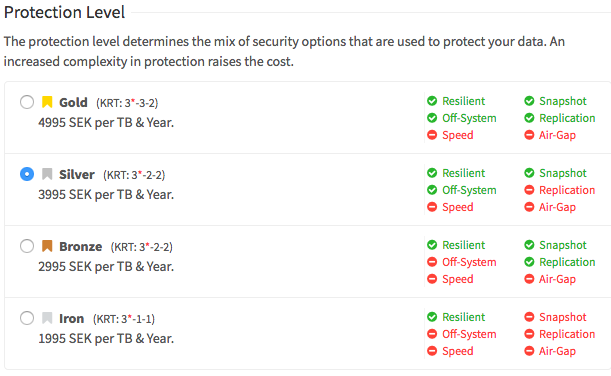 Reliability-Price comparison There is a very small risk of data loss in a well set up PC file server with backups. The same applies to the HNAS system, although it is more expensive and as seen above, more available.